Snowberries; “Galaxy” is the white, and “Candy” is the pink. Photo courtesy of Sunnyside Nursery. One of the treats of a fall garden is enjoying the sight of clusters of different colored berries on our shrubbery. In my own backyard is a delightful Beautyberry, called “Profusion,” that has the most incredible purple berries later in fall. The shrub itself is nondescript, but when the berries arrive in the fall I immediately remember why I have allocated so much space for it to grow. As I mentioned above, Beautyberry is an easy-to-grow shrub hailing from Asia that loves the sun and once established is drought tolerant. It will grow up to six feet tall, but I chop mine down every couple of years to around three to four feet tall and it doesn’t seem to mind. In the summer it produces very small and inconspicuous flowers that eventually set the intense purple iridescent berries that hang on long into the winter. I recently discovered two new introductions in the nursery that are an improvement on “Profusion.” “Pearl Glam” sports dark purple foliage from spring until frost, white flowers in the summer and a more upright growth habit. “Purple Pearls” is almost the same only with pink flowers in the summer and slightly larger berries in the fall. Both are well worth growing in our gardens, especially if you are a Husky fan. 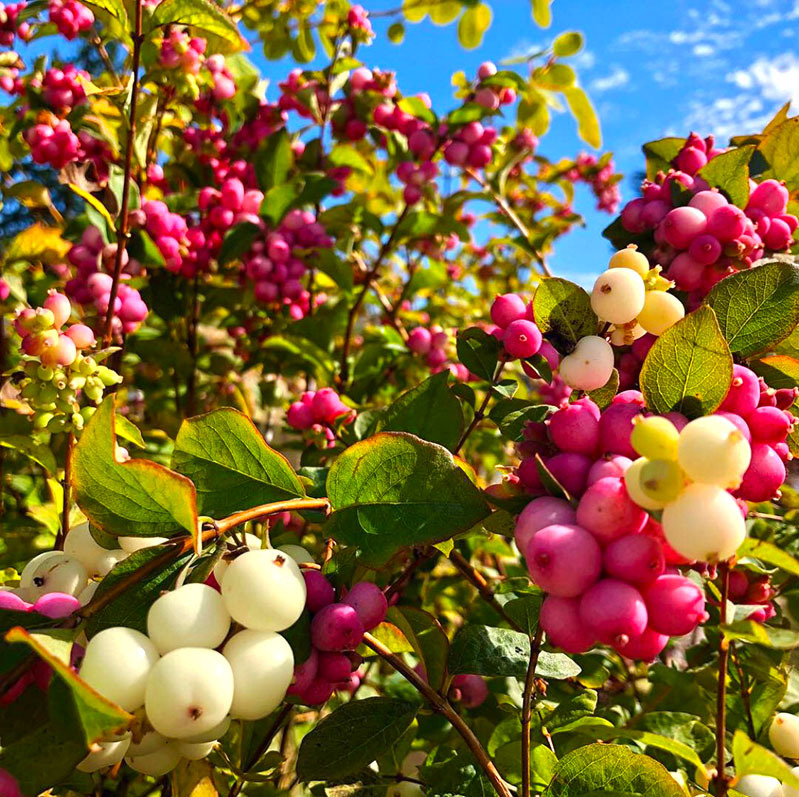 Most of us are familiar with our native snowberry that grows wild in our forests, meadows, and riverbanks, and sports big half-inch marshmallow-looking fruits throughout the winter. The berries are a rich source of food for wildlife but the plants are rangy, a bit too tall for most gardens, and the fruit seems to turn brown much too quickly. Enter two new hybrids, which are crosses of two or more North American natives that stay below three feet tall, fruit heavily, and last much longer into the winter. “Galaxy” has large white berries and “Candy” has lovely pink berries. These new hybrids are a tidy addition to the mixed border and will delight not only the gardener, but also attract wildlife into the garden. They are very easy to grow and can function anywhere from a scattered specimen to an entire hedge. Full to partial sun and adequate moisture is all they require. My third pick comes from the Saint John’s Wort family or Hypericum. Hypericum comes in many forms, the most common being a sun and drought tolerant ground cover with golden yellow flowers in summer. Several years ago this form, that has been grown for decades in the floral industry where the berries are prized for their cut flower value, crossed over into the landscape trade and became an instant success. These can usually be found in garden centers this time of year in the seasonal color department where they are merchandized as components for containers, but the truth is that they make very sturdy and reliable shrubs in the garden. Varieties have been selected based on the color of the fruit and you can find a vast number of named selections. “Red Star” has clusters of red berries and “Pumpkin” of course has glowing orange berries. All of these new shrubs are easy to grow and will provide fall and winter interest in our gardens. Plant them now for immediate gratification and future enjoyment. Sunnyside will be hosting a free community and family event, our annual Customer Appreciation Day, Saturday September 29, 2018, from 10:00 am to 4:00 pm (for more info visit www.sunnysidenursery.net/events).